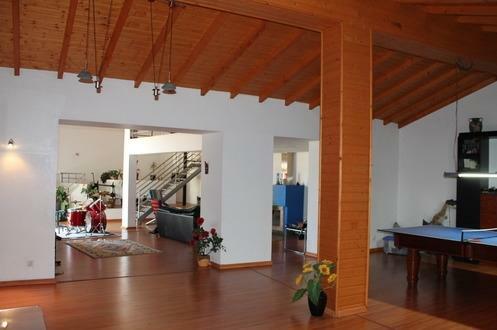 4 bed villa plus 2 bed annex Sao Bras - Property for sale. Full Description: This unique property was originally a cork factory dating back to 1907. Completely redesigned and rebuilt by the current owner in 2000 to create a substantial family home plus separate guest annex. Located just 2 minutes drive from the centre of the quiet town of Sao Bras de Alportel the location is perfect for holidays or permanent living. Retaining many of the original features yet offering all the modern home comforts you would need this property has a lot to offer. The main house comprises of a huge lounge with fireplace, high ceilings and has a feature cork press, now made into a wine cellar. Stairs from the lounge lead up to the large office which could easily be used as an additional bedroom. From the lounge an equally large room doubles as games room and dining area. Off the hallway are 3 double bedrooms with fitted wardrobes, the master suite with separate dressing area and large bathroom with shower and bath, another bathroom and shower room plus small laundry. The kitchen is fully fitted and equipped with all appliances, an island, pantry and dining area. There is additional wardrobe storage in another hallway plus guest w/c. Outside there are extensive seating and sunbathing areas around the swimming pool (with Jacuzzi) and gardens. Other original features are the well that supplies water for the garden and pool, the old washing area next to it and the original factory chimney. Next to the pool is the outdoor covered kitchen, bar, BBQ and relaxation area, perfect for chilling with friends or watching the sport on tv! There is also another larger laundry and a guest w/c. There is a large parking area just inside the remote entry gates, garage, plus 3 separate storage/machine rooms. As well as all this there is a separate self contained annex comprising of a kitchen, dining room, lounge, bathroom and 2 bedrooms. It's difficult to capture the feel of this property in photos and really should be seen to appreciate fully.